"How to Zig Zag Diet for Fat Loss Like Fantastic Mr. Fox"
Sick of starving yourself silly? Discover how to zig zag diet for fat loss like Fantastic Mr. Fox. 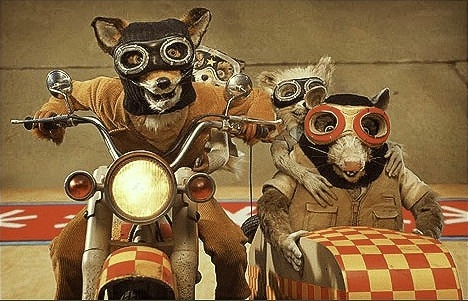 Ever see the film, Fantastic Mr. Fox? This Roald Dahl story tells the tale of a fox who steals food each night from three miserly farmers, and furious with Mr. Fox's treachery, the farmers set out to kill him. Yet there is a problem with the farmers' diabolical plan. They hadn't counted on Mr. Fox's cunning. Able to outwit the farmers at every turn, Mr. Fox leads the animals to the sanctuary of life underground. It's a fabulous film and I recommend it. But what does this story have to do with the zig zag diet? Well, just like Mr. Fox in the Roald Dahl story, your body is a cunning fox too. This is why every time you cut your calories in an attempt to get lean, it's never long before your body outwits you and adjusts your fat burning thermostat so less calories are burned. The result? A sluggish-slow metabolism. Why does this happen? The thing is, your body is an extremely clever machine. Able to adapt to any situation or environment, your body will fight tooth and nail to remain in its preferred state of equilibrium. So, is there a way to outfox Mr. Fox? Fortunately, there is. One simple diet strategy can keep your metabolism high while you effortlessly drop fat. This strategy is called the zig zag diet method and it is a powerful fat burning tool. Not only that, but this "diet trick" can also help you outfox your body's starvation response and keep your fat furnace burning brightly. How does the zig zag diet method work? It's simple. You just drop your calories for a brief period of two to three days, then - before your body realizes what is happening and can react - you raise your calories back up to maintenance levels for two to three days. Zig zagging your calories in this manner is easy to do. You can use low, medium and high days in a pyramid fashion, or you can employ the two to three day day cycle above. On high days, increase your calories to maintenance levels. High days = 2,500 calories. You see how easy that is? This super-simple diet strategy really is an effective method of losing fat, and is as cunning as any fox!